Holds 10 Filters up to 4 x 6"
The FPB-3108B 10-Pocket Filter Pouch for 4 x 6" Filters from Ruggard is made of a durable nylon exterior with an accordion-style pocket system that holds 10 filters up to 4 x 6", and the interior has soft cloth dividers, which will not scratch the surface of filters. At the front of the pouch, an accessory pocket is present to hold tools or a filter holder system with adapter rings. Once you zipper the double side closures and flip closed the overlapping cover, it makes the pouch weather-resistant against the elements, but retrieving the filters is easily made with the stay-open fastener. To travel with the pouch, the belt loop attaches directly to your belt and secures via the touch-tab fastener. The pouch can also be carried by the adjustable shoulder strap, which has an adjustable length of 30.7 to 51.2", and the tripod strap makes the pouch more accessible by wrapping the strap around the tripod's center column and securing it with its speed clips on the pouch. The pouch has an accordion-style pocket system with soft cloth dividers that hold 10 filters up to 4 x 6". A front pocket pouch holds tools or a complete filter holder system with several adapter rings. A durable nylon exterior, double zipper side closures, and an overlapping protective cover make the pouch weather-resistant. Three options are available to carry the filter pouch: a belt-loop with touch-fastener, an adjustable shoulder strap, and a tripod strap with speed clips. Box Dimensions (LxWxH) 7.0 x 5.0 x 2.0"
FPB-3108B 10-Pocket Filter Pouch for 4 x 6" Filters is rated 4.8 out of 5 by 4. Rated 5 out of 5 by Bryan from Great Filter Holder Ive been able to use this pouch for about two months now and think it is the best filter pouch that Ruggard has made so far. The pouch holds ten 4x6-inch filters. The dividers are made of a soft fabric and the filter holder includes a strap that allows it to hang off the side of a tripod. It has a zipper on each side. When unzipped, the fabric dividers fold out accordion-style. Theres also a belt loop. On the front of the pouch, theres an extra pocket that fits a holder and a couple of accessory rings plus a small bottle of cleaner and a microfiber cloth. In the field, I found that it was easy to use. It hung off my tripod like I would expect. I shortened the included strap by tying a knot in it to shorten it a little bit. The shortened strap worked better with my tripod and ballhead setup. I like it shorter, but you might like it longer. I found that I seldom used the zippers on the side of the holder because it was easy enough to get the filters in and out without having to unzip the sides. Having the pocket on the front was nice for organizing my filter holder and adapter rings. Thats a really nice touch and one of my favorite parts about the pouch. While two months isnt enough time to see wear and tear, it shows none and I expect it to last a long time. If youre looking for a no fuss filter holder that has a strap to hang from your tripod and has practical features such as an accessory holder pocket, then this pouch is for you. Rated 5 out of 5 by Joshua from Better than the name brand for half the price. I was looking for an all-in-one filter pouch for my LEE 100mm filter system, something that would hold everything. This one was half the price of the official branded pouch but also has an extra pocket in the front for your filter holder. So heres the verdict: - Will it hold 100x 150 and 100x100 filters? Of course, thats what its made for. - Will it hold my base LEE filter holder (with two slots for filters) with the accessory ring (for the polarizer) attached? YES! It slips right into that extra front pocket, exactly what I was wanting. No problems still closing the top flap, the holder with accessory ring attached doesnt make it so wide where its a chore. - Will it hold my LEE 100x100 10-stop ND filter with the hard-shell case it comes in? Unfortunately no. Well, I should say that yes, the hard case will actually fit in there if you force it pretty heavily. Will take some effort to get in and out but technically it does fit. Might even help stretch it out a bit as you use it but you could also tear something. For me, Ill just put the ND filter directly into the pouch and set the hard case aside. - Will it hold my 77mm WA adapter? Of course, the slots are at least 100mm wide. Material seems soft enough not to scratch (geez, I hope so). All in all, happy with the purchase. Just need more filters. Rated 4 out of 5 by Sheik from comfortable product well made, easy to use. good product, would have loved the top flap a little stiff. 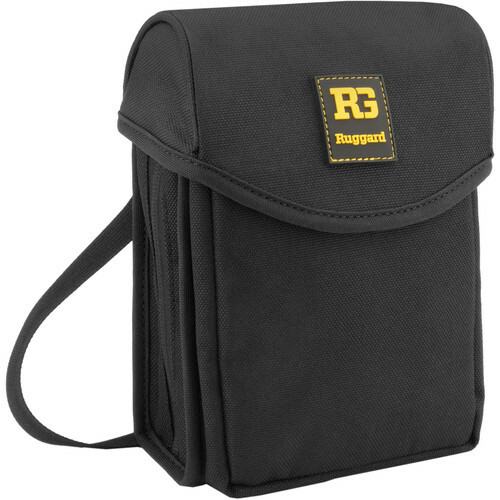 Does this Ruggard filter pouch have different type of interior fabric than those old Ruggard filter pouches? Ruggard used to use some type of interior fabric that would produce a fog layer on filter glass surfaces after they were stored in the filter pouch for awhile. This was reported by other users and I also experienced it too. So I don&rsquo;t use any of the Ruggard filter pouches I bought before. I hope Ruggard has changed the interior fabric, and I would like to buy one because this filter pouch looks good and priced reasonable.